What a pleasant surprise this weekend's weather turned out to be. Scattered storms were forecast but we only saw nice weather. Saturday Leesa and I hiked in the northern most section of the Adirondack Park (Lyon Mountain and Silver Lake mountain), but I'll report on those tomorrow. On Sunday, we decided to climb another Adirondack High Peak - Mount Marshall. We parked at Upper Works, off of Blue Ridge Road. We didn't get to the trailhead until 9 AM, but there was still quite a bit of parking space available. We were surprised, since it was a holiday weekend. 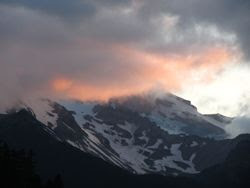 We chose this hike to purposely avoid the most popular hiking areas. We headed north from the trailhead towards Indian Pass and after .4 miles, branched right on the Calamity Brook Trail. The trail travels northeasterly along the brook for 4 miles to Flowed Lands. The trail is a great backcountry ski trail in the winter. This was my first time on the trail in summer, and it looked entirely different without the snow. It's a nice gradual 1000' climb in the 4 mile route. Once at Flowed lands, the trail skirts around the western shore. We saw 3 or 4 tents in the Flowed land area. Looking North from Flowed Lands towards Avalance Pass. Mount Colden is on the right. At the NW end of Flowed Lands is the Beaver Point Lean-to and the beginning of the Herbert Brook herd path to Mount Marshall. There is a rock cairn marking the start of the herd path. We stopped for a few moments at the lean-to for a snack before starting up the herd path. We knew from looking at the map that we would soon be climbing about 1500' over the course of the next 1.5 miles. The Herbert Brook herd path is not an easy one. It climbs rather steeply and has lots of roots and mud and also crosses the brook many times. That said, it is a pretty trail. The brook has many waterfalls and water slides. There are also many inviting pools to cool off in during the hot weather. We reached the summit around 2:30 and sat down for a bit to enjoy our accomplishment. While on the summit, we met "Rockbiter" whom we had seen before on another hike (can't remember which one). He gave Rev 4 pieces of beef jerky and she loved it. She wasn't too polite though. She barked for more. As had been reported by others, Marshall doesn't have much of a view. There is a limited view of Iroquois to the north, and if you walk slightly south from the summit, there is a decent view. After a bit, we retraced our track back to the car. We made better time on the way out and were back at the car at 6:30 (about 4 hours to return). We quite enjoyed the nice day. The weather was unexpectedly nice and there were no bugs! From the viewpoint, looking east. Mount Marcy on the left. Looks like a beautiful place. I love reading about hikes in other parts of the country. Thanks for sharing. What a great hiking backyard you have. It would be great to hike with you one day or two - in the fall. Sounds great. Let us know when you start to plan your fall trips. Good for you for finding those views. A lot of climbers miss out on Marshall's views. Nice pics, beautiful day! Will do! We have a great hiking dog too, if Rev likes company. Let me know if you plan any kayaking trips out our way. thanks for a great trip report! So helpful to have good descriptions on the various land-marks. We hike Marshall today, only 6 left! Made great time from UW, had rain all the way out, which wasn't terrible, much better than earlier in the week HEAT!Too bad 4 of mt last 46 are the Sewards! Any sage advice for the Sewards hike is appreciated! Thanks! I haven't done the Sewards yet, but I probably will in the next 2 weeks. I'm hoping to finish my 46 in July and the Sewards are on my list too. As always great reports, planning this one next Sunday 5/18/14! Will be my halfway mark! Don't forget to stop at the Herbert Brook lean-to at the base is the herd path for a snack before you climb. Leesa and I are the lean-to adoptors for it. From the lean-to, you can also follow the short herd path that leads to a nice sandbar on the Opalescent River. It's only a couple hundred yards from the lean-to. Thanks for the additional info! And also just saw your trip report for OK Slip Falls- excellent I know feel comfortable going there, I knew a few people who had trouble finding the trails/parking etc.....your info as always helps!! I plan to do Marshall and Allen this weekend. Are there campsites available near the Upper Works parking lot? I plan to do Marshall first and then Allen on the next day. Thanks, Reese. I don't believe so. There are several places to car camp on Blue Ridge Road, or there is the Sharp Bridge Campground in North Hudson. Hi Mike, Love your website; your trip reports are truly fantastic! I am planning a trip in early October that will take me up 5 or 6 peaks over the course of 3 days (Thursday, Friday and Saturday, hike out Sunday): Colden, Cliff, Redfield, Gray, Skylight and hopefully Marshall. Perhaps Marcy too if we are feeling ambitious enough. 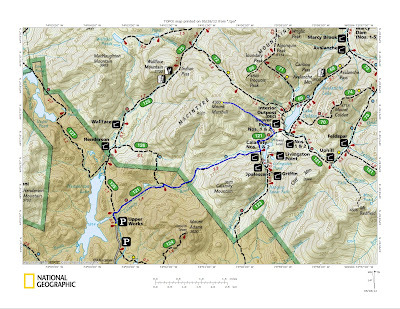 I am planning to head in from upper works and set up camp either at flowed lands or lake colden. I am wondering how you determined the different mileages and elevation gains. I am trying to plan out individual day trips up the different peaks and I can't seem to find the information I am seeking online; for example: distance from Lake Colden to Gray, then Skylight and back again to Lake Colden. Any insight you could provide would be much appreciated! Hi. Sorry it took me so long to respond. I've been off the grid. I used my GPS to determine my mileage. The elevation gain I reported was from Google Earth after I imported my track. Come to find out that if was often wrong and it seemed to be off (overinflated) by about 15%. I realized this sometime in 2013 or 2014. My newer reports should be more accurated on the reported gain. 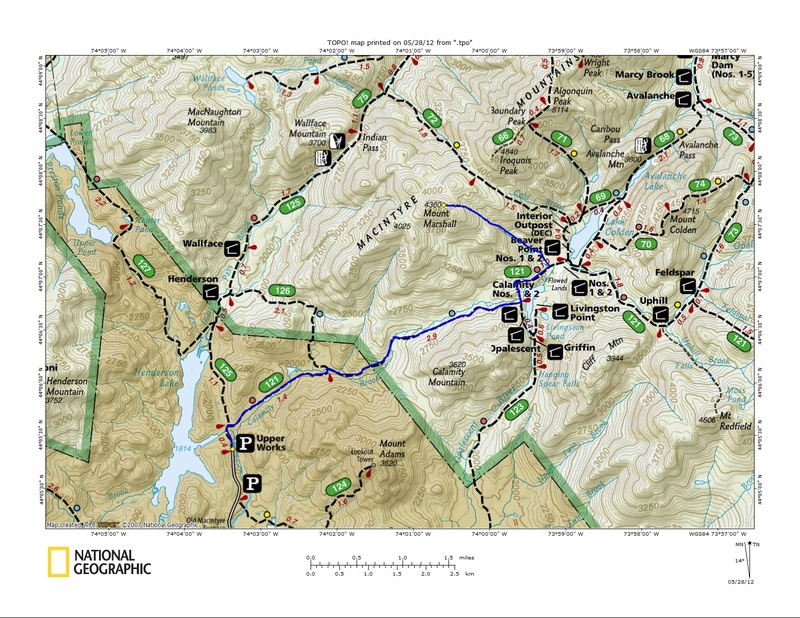 You can find distances on the National Geographic maps or the ADK High Peaks map, or in guidebooks. Sounds like you've got a great trip planned. Early October is an awesome time to go. I hope you have good weather and a great trip!